Is there any way to locate a deleted transaction that was previously reconciled? I have a transaction from May that was deleted in error in December. Is there anyway to locate this transaction? Hopefully you can locate this transaction information for audit log. 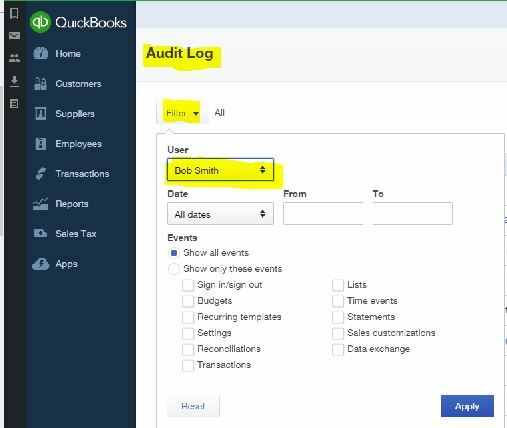 I removed a user from my manage users in quick books online version. Is there any way to pull up her activity log? I want to have a paper copy of her activity. You can run “Audit Log” report. This report will give somewhat detailed work log report. Go to filter (left top corner) > select user’s name > apply > select “print” icon (far right corner). User has to sign out in order to see on logged out time. If user just close the browser then, there is no time stamped in audit log report.